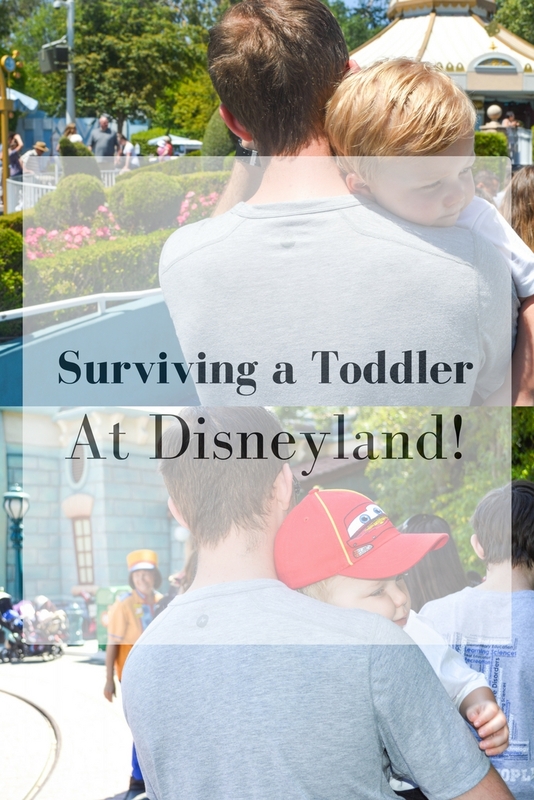 We survived Disneyland with a toddler! And actually had a blast! 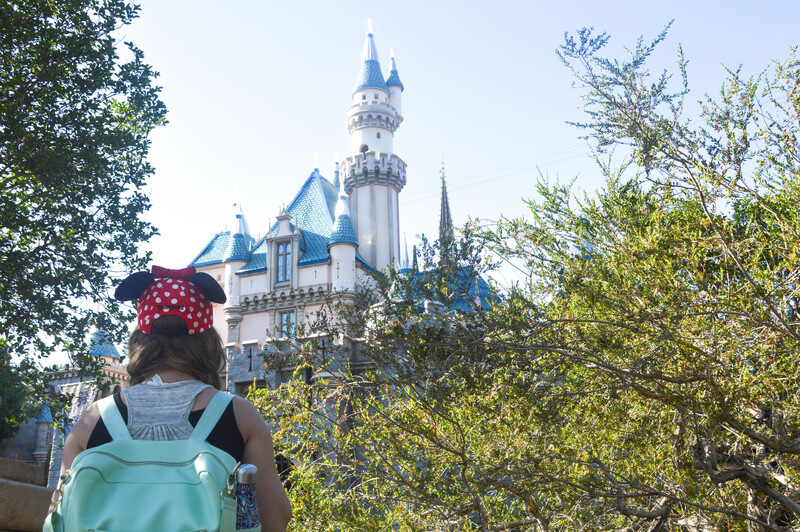 There are so many tips and tricks to make your trip to Disney magical instead of stressful. And believe it or not, there’s actually a lot for your little one to do (as well as pregnant women). Even though you can’t do the “big” rides, it can still be a really special day! Disneyland is one of my favorite places on Earth. 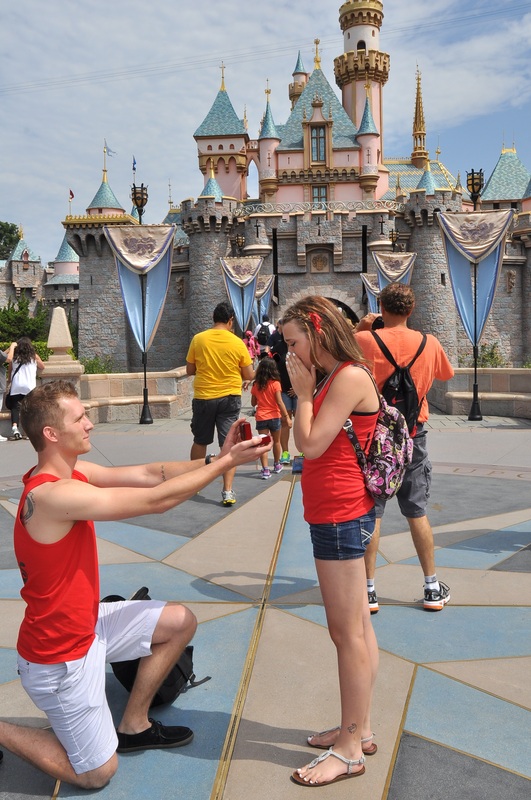 I have so many wonderful memories of the parks growing up and my husband and I actually got engaged there. Disclaimer: I received select products mentioned in this post in exchange for review. All opinions are my own. This post may contain affiliate links. 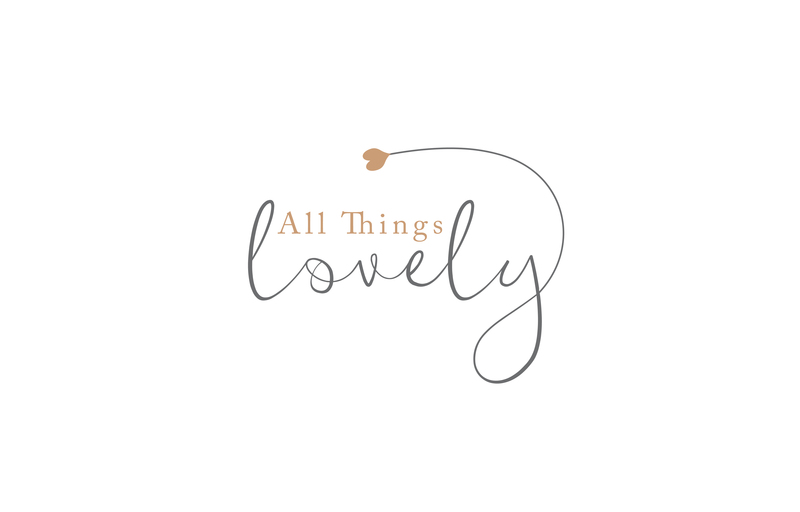 Please see my disclaimer page for more information. 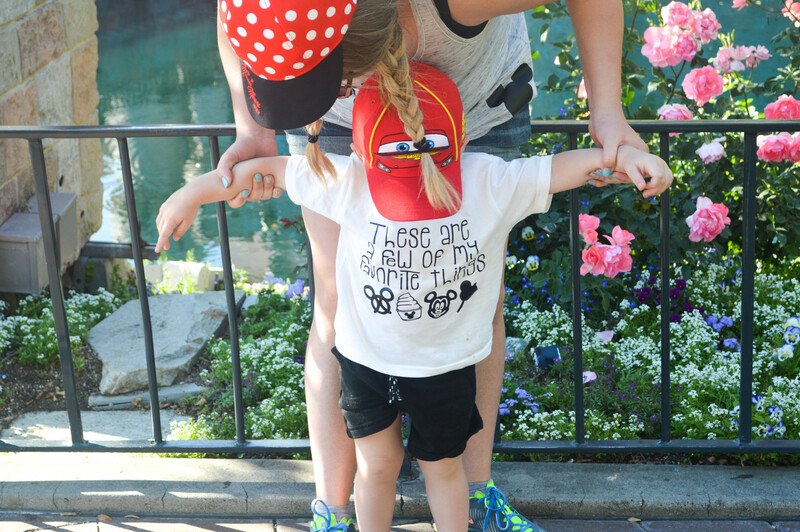 Disneyland means a lot to me and our family. In a way, it’s where we started our journey and our family and that will always be so special to me. I’ve been wanting to take Sawyer for a while, but we wanted to wait until he was old enough to really appreciate it. At almost 2, it was really the perfect age. 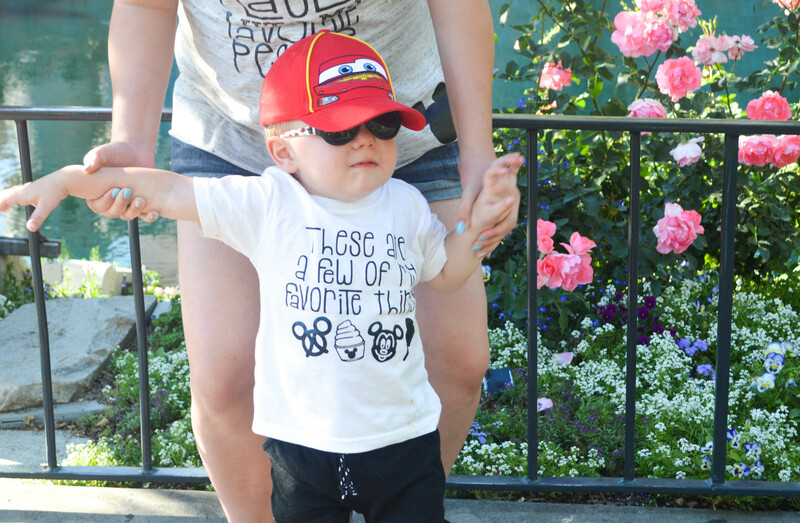 He’s been obsessed with Mickey Mouse Clubhouse, Mickey and the Roadster Racers, Cars, Moana, The Lion King, Frozen, and more for months! 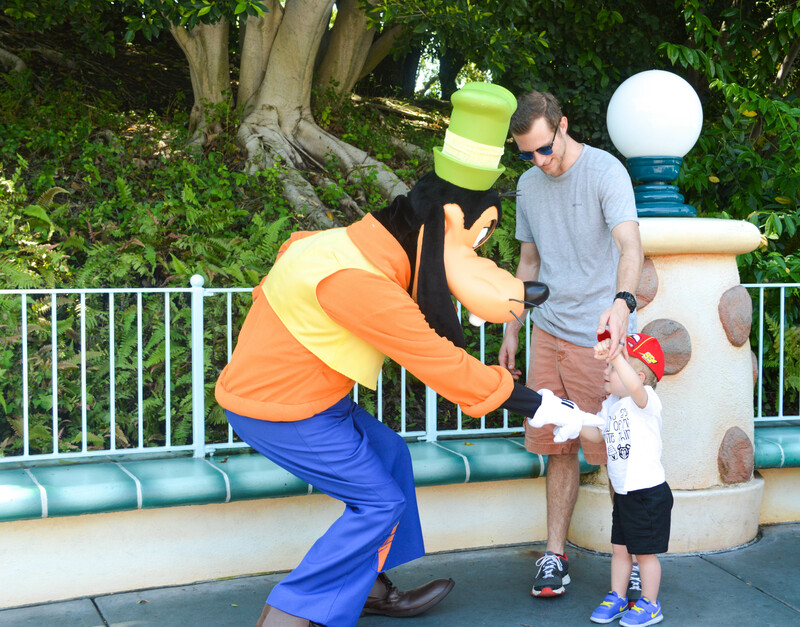 So he was extremely familiar with the characters, decor, and ambience he saw around the park and everything was so exciting to him. 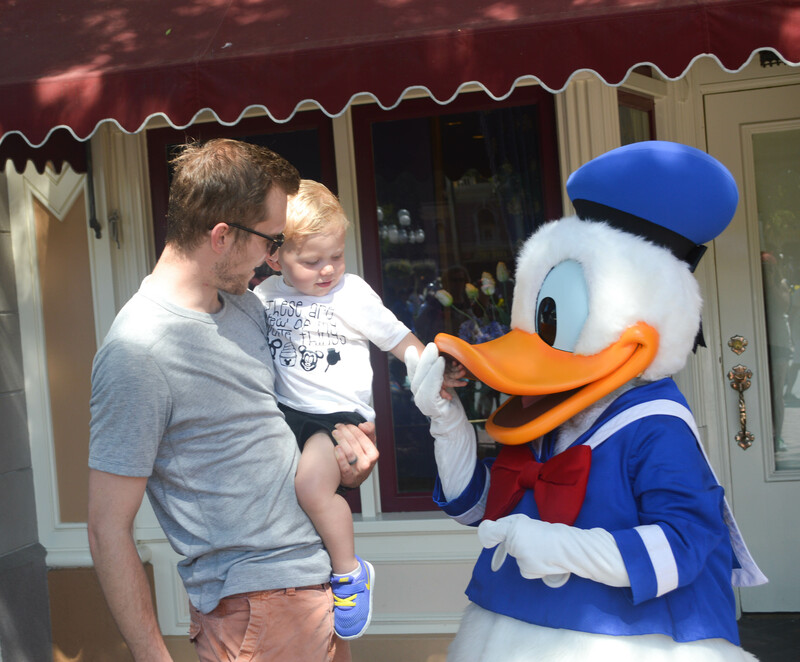 If you’re heading to Disney soon, my first tip would be to immerse your toddler in Disney magic before you go. 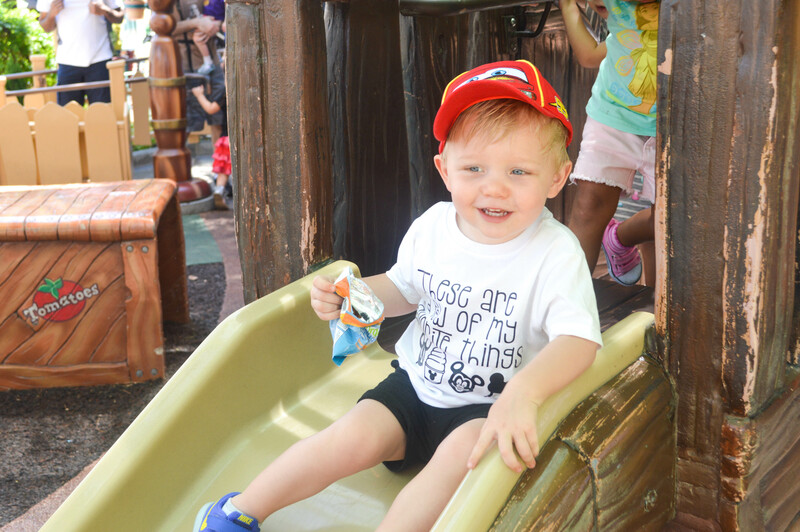 Have them watch a lot of Mickey Mouse Clubhouse and Disney movies in the weeks leading up to your trip so they’ll be excited entering the park! Sawyer didn’t really understand where we were until we were walking down mainstreet. We passed by the Emporium on Main Street and there were Mickey Mouse plushes in the window. He caught of glimpse of them and went “Mickey? Mickey! Mickey! 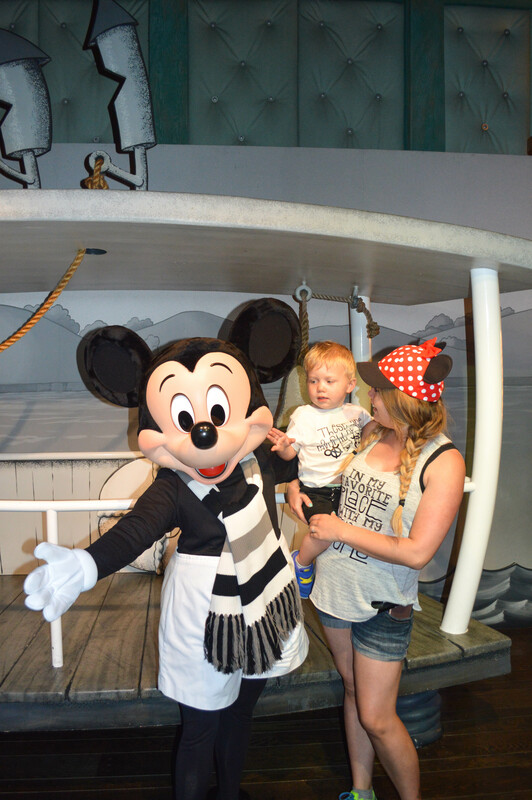 Mickey!” and immediately started trying to escape his stroller. It warmed my heart. This is going to go one of two ways. 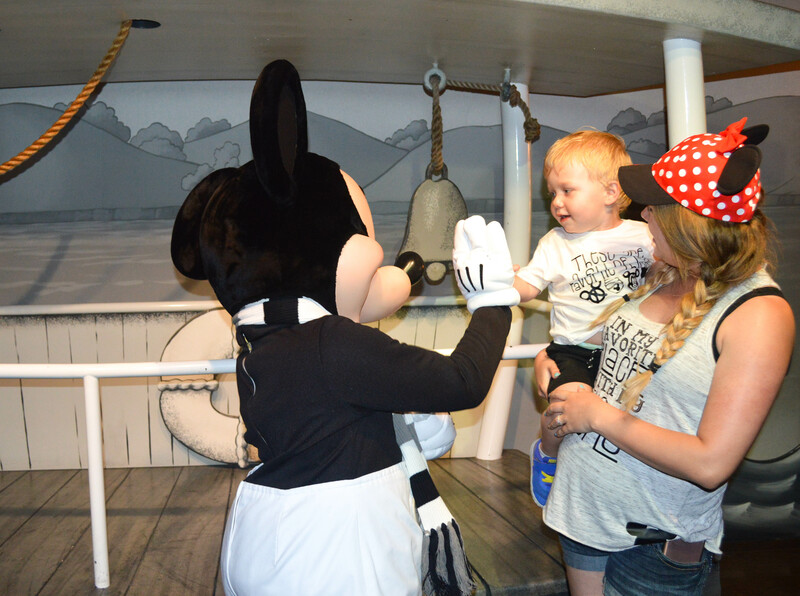 Your child is going to freak out that they’re favorite character is right in front of them and be so happy, or your child is going to freak out at the giant costumed mouse in front of them and be terrified. I showed Sawyer this youtube video frequently in the weeks leading up to our trip which I think helped him feel comfortable around the characters. It’s actually a copy of a Disney Sing-Along VHS I watched all the time as a kid! Sawyer loved watching this video and it has all the costumed characters in it which I think made it easier for him to be around them in real life. It also features all the areas of the park (albeit, in the 90’s), which I think also helped him to recognize where we were upon arrival. Sawyer’s experience with the characters was great and absolutely magical. 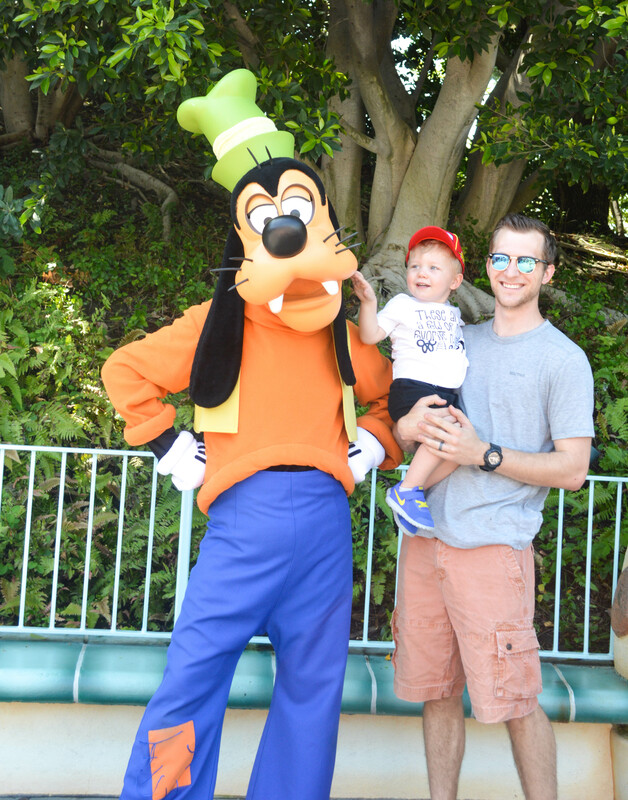 He wasn’t scared at all and was so excited to meet them! 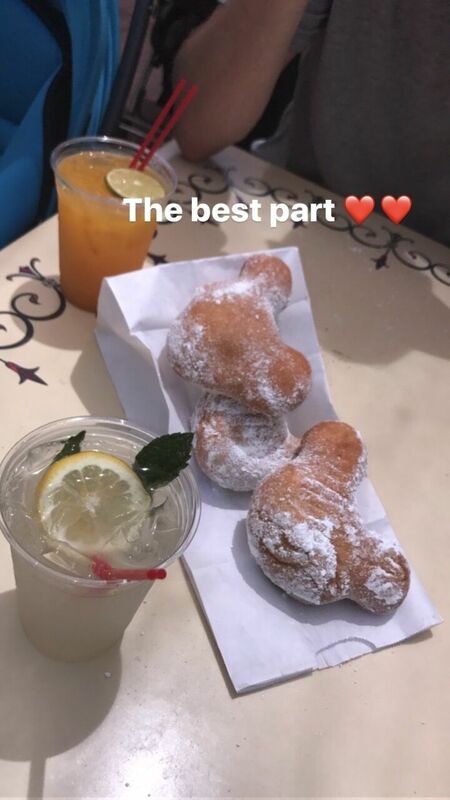 Mickey was definitely the best part. It was the last thing we did before exiting the park. 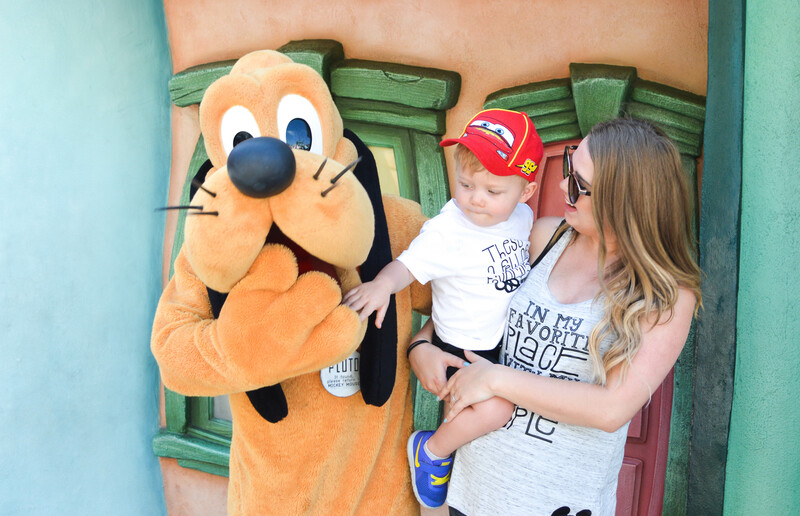 There was a 30 minute wait and we were exhausted and ready to go home, but I knew if we didn’t take him to see Mickey, I would regret it. I’m so glad we went. Sawyer was ecstatic. 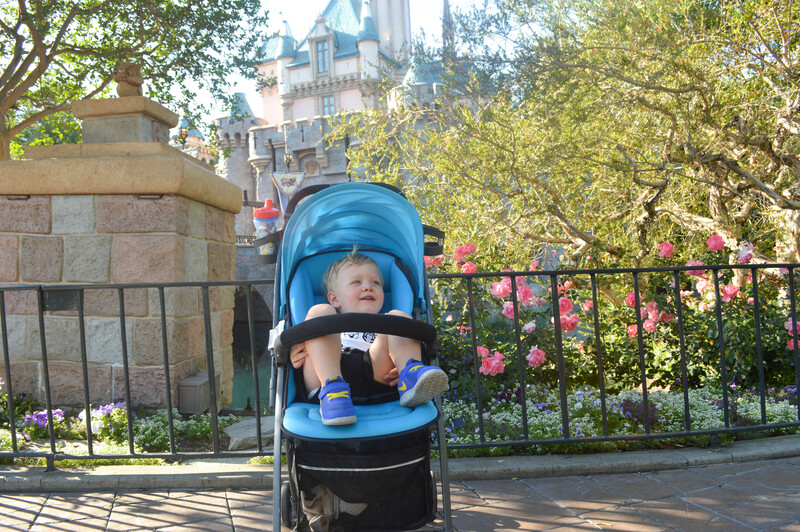 Your kiddo is going to spend a good chunk of the day in the stroller, you’ll want to bring one that’s sturdy and comfortable! We chose the Balloon by Joovy because of all the comfy padding, the easy to maneuver wheels, roomy basket, and big canopy. The Balloon converts to a bassinet, which is perfect for on the go naps. Around nap time, we pulled the canopy down, converted the stroller to bassinet, gave him a sippy cup of milk, and he was out! He slept for almost an hour while Kurtis and I relaxed in the shade and had some snacks all to ourselves. 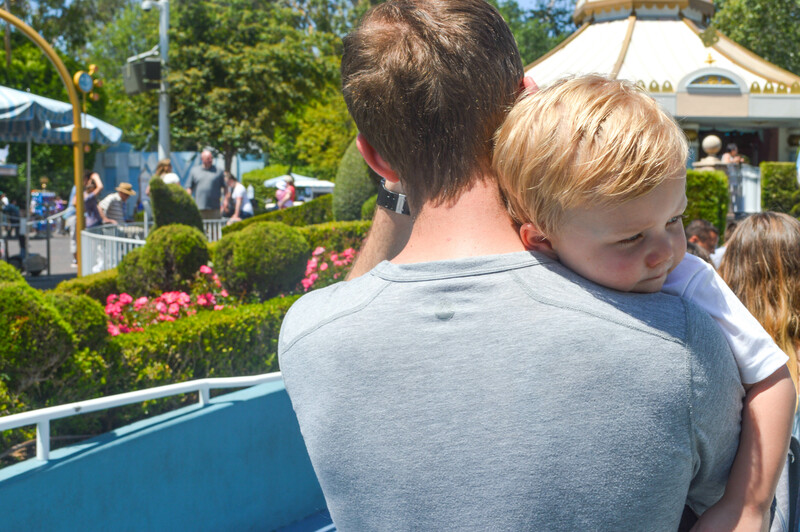 It was a great little “recharge” for all of us and after we were ready to tackle more rides! The Balloon also has 2 cup holders and a basket. 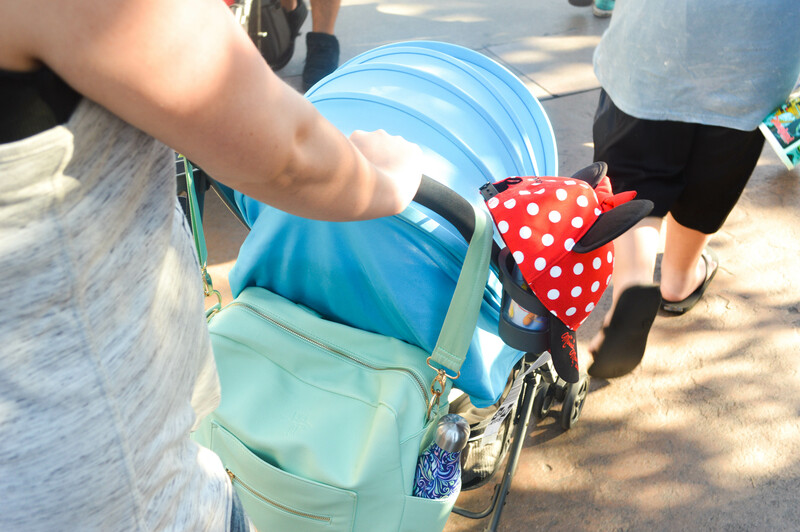 We were able to hang my diaper bag on the handle, and keep my camera bag and all our jackets in the basket. The Balloon even has a reversible handle so that you can see your child or baby in reverse stroll mode. Thanks Joovy for making our day a little easier! See? 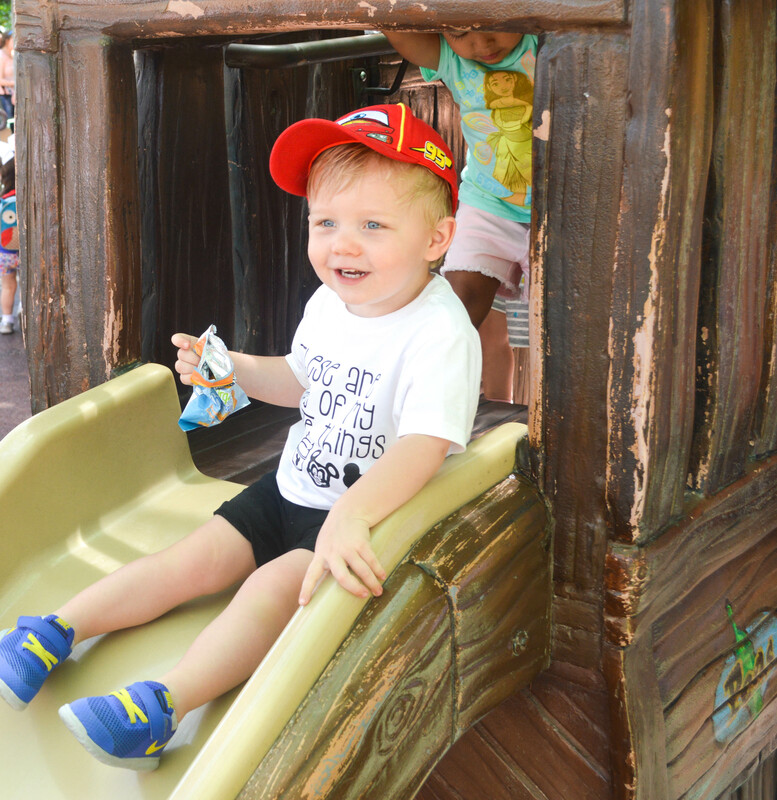 There are a lot of rides with no height limit that you’re little one can enjoy. 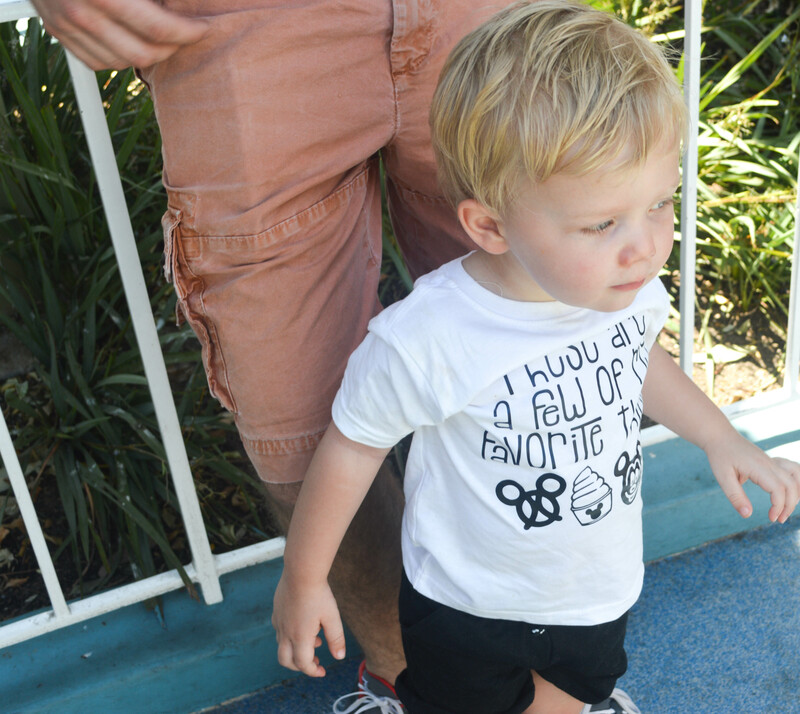 And if you’re pregnant, a good rule of thumb is anything your baby/toddler can go on, you can go on too. 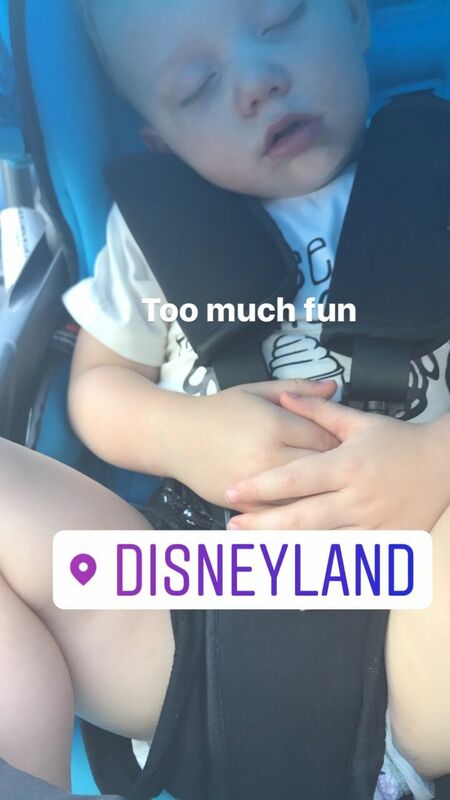 Yes, we are the dumb parents who thought it would be fine to take our 2 year old on the Haunted Mansion. Our thinking was that it was dark and cool and slow moving and he was probably too young to process what was supposed to be “scary”. But we were wrong. Don’t take your children on this until they are older! We didn’t go on Snow White’s Scary Adventures but we’ve been told that’s a little too frightening for little ones as well. We were able to get about 8 rides in. We probably could have fit in a few more had we stayed later but we left earlier in the evening because Sawyer was drained! 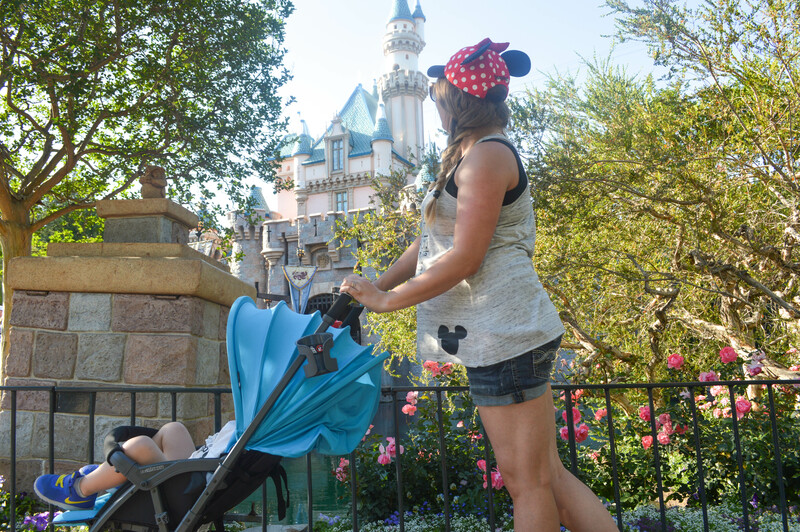 There are lots of great places in the park to let your kiddo out of the stroller to burn some energy. Especially in Toon Town! There’s Chip N’ Dales Treehouse, Goofy’s Playhouse, and Donald’s Boat. All are basically little playgrounds. There’s Tarzan’s Treehouse in Adventureland too! 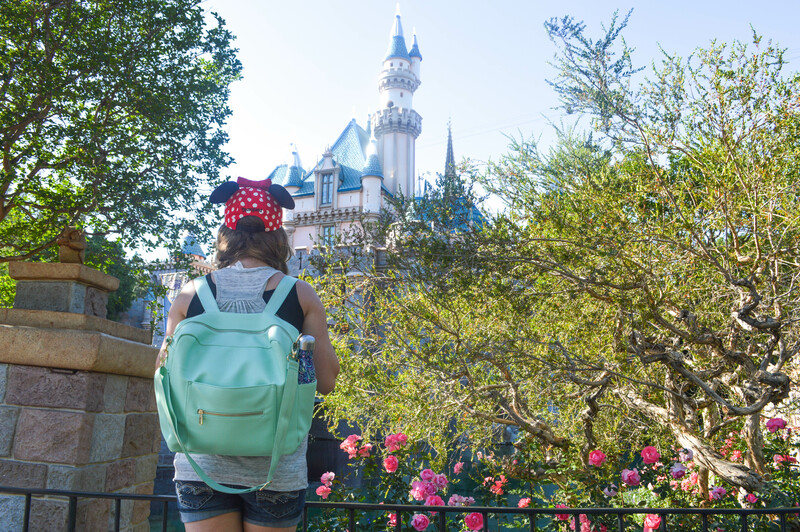 A day at Disneyland is no ordinary day and you’ll want to pack your diaper bag accordingly. 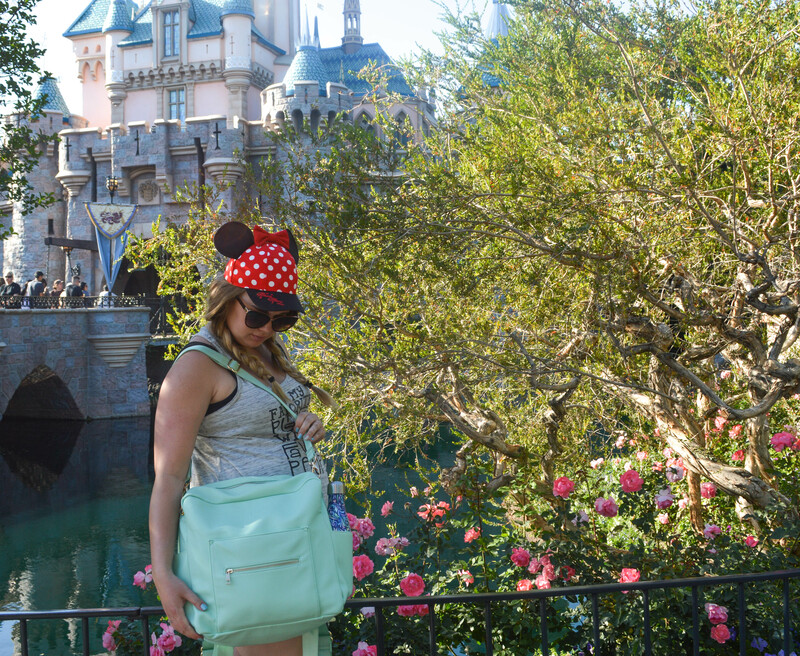 We upgraded to a Kiki Lu diaper bag just for this occasion. You’ll need something you can wear as a backpack with plenty of room and lots of pockets! It all fit nicely into my Kiki Lu and I felt well prepared for anything the day threw at us! Pro tip: We also set an alarm on my husband’s phone to remind us to reapply sunscreen every 2 hours. The last thing you want is a bad burn! I also recommend taking advantage of the Baby Care center! They have private rooms for nursing and pumping. Microwaves for heating up breastmilk, formula, regular milk, and food. Padded and convenient changing tables, rocking chairs, mini fridges for breastmilk, and more! 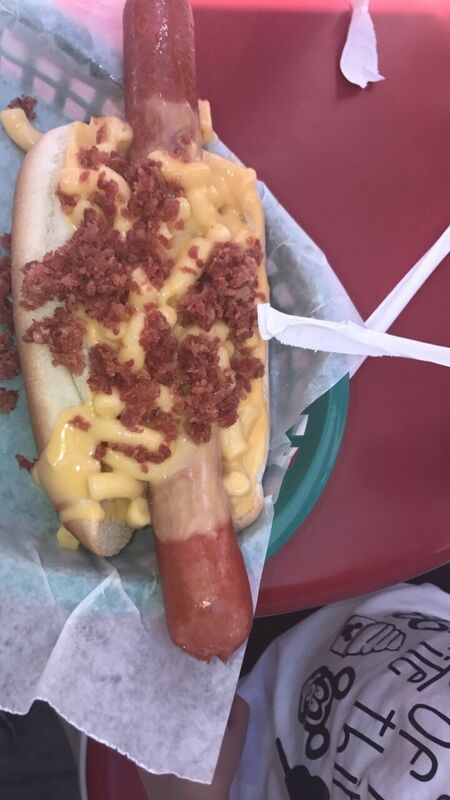 It’s at the very end of main street behind the corn dog cart. 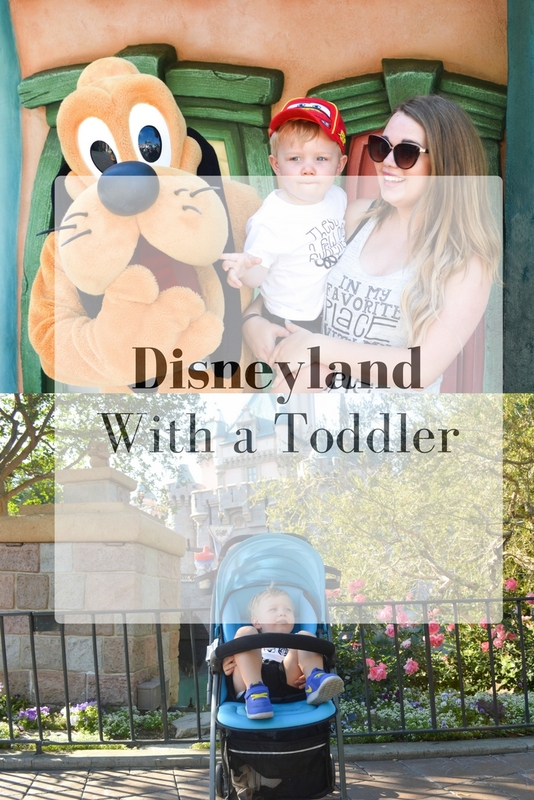 If you are visiting the park with a child under 4, definitely take advantage of it (California Adventure and all the Disney World parks have Baby Care Centers as well)! I’m sure you’ve heard it before but wear shoes you can do a lot of walking in. We all wore Nikes, and I even bought some Dr. Scholl’s insoles for mine, which was a great idea since my feet are aching and swelling so much from pregnancy. Also, make sure to dress weather appropriate. 3/4 out of the year California is hot but it also can cool down at night, or sometimes rain! Always bring a light jacket, just in case. 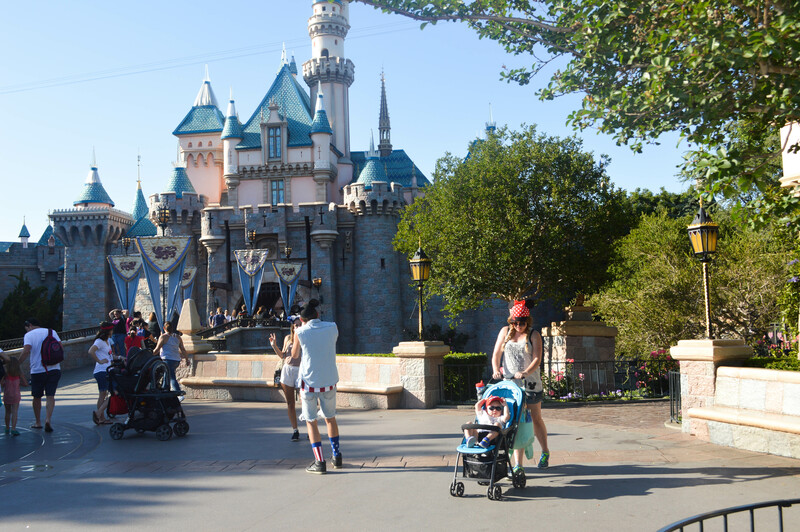 We each brought a sweatshirt and kept it in the basket of the stroller. But, aside from that, wear something festive and fun! 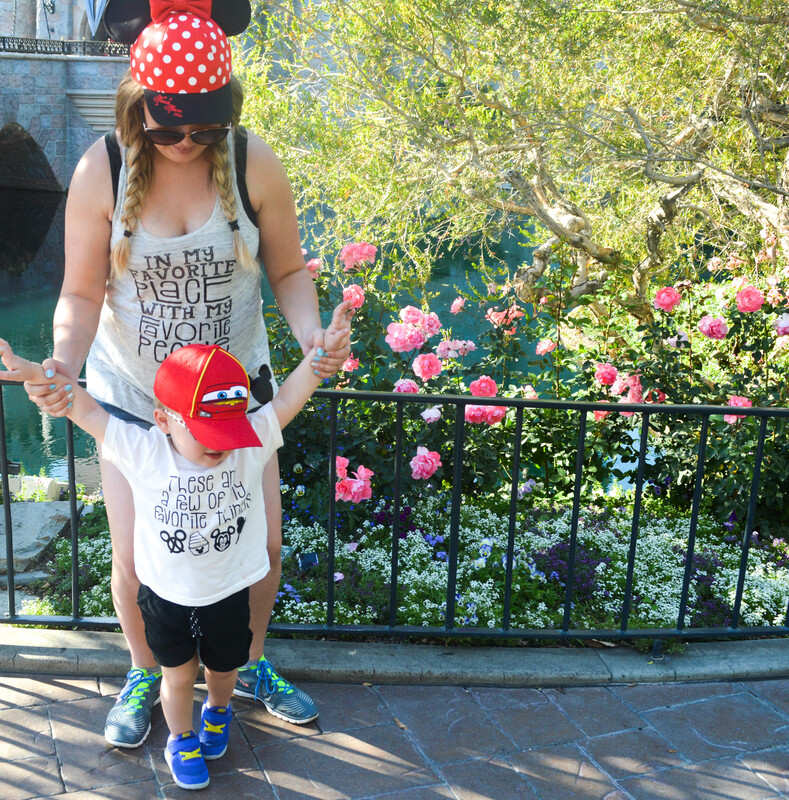 Sawyer and I both wore Disney themed shirts from b.rose and Disney themed hats! The day will be so much more fun if you’re festive! 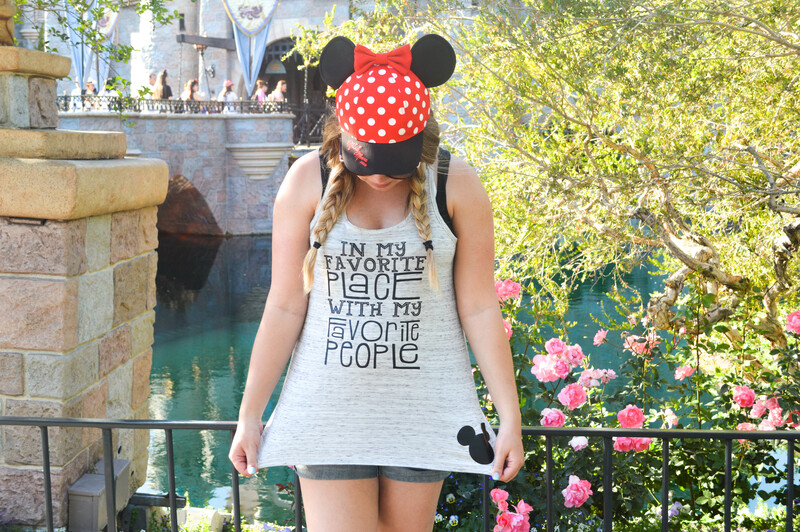 Plus, when else it is acceptable for a grown woman to wear a Minnie Mouse hat? Everything, everything that you see inside the parks you can also find in the World of Disney store in Downtown Disney, located right outside the park gates. Rather than shopping throughout the day and having to lug our bags around the park, we made notes of things we might want and then got them at World of Disney on our way out. That way, we could take our bags and get right on the tram. Also, throw an extra duffle bag in with your luggage! We always fly Southwest which allows for 2 free checked bags per person, so we can bring 4 bags! We usually only need 3 (1 for each of us), so we throw in an extra duffle so we have an extra bag for souvenirs! Sawyer picked out an extremely large Lightening McQueen as his souvenir, but we were able to get it back to Colorado with us easily by putting it in our extra duffle and checking it. Churros- Get them at any churro stand! 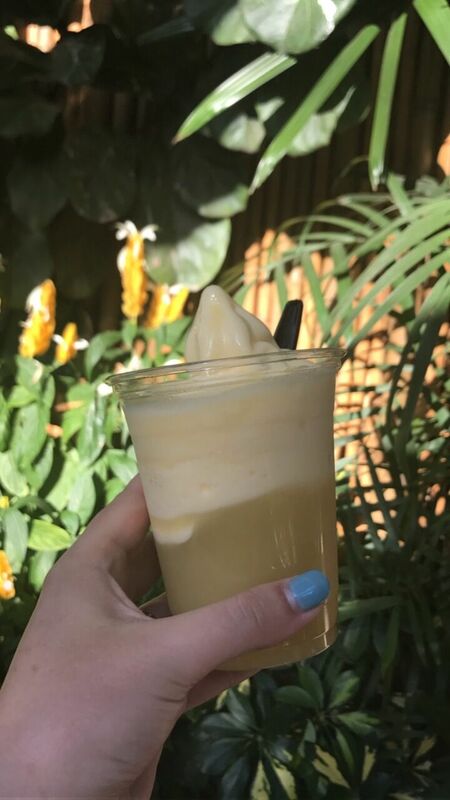 Dole Whip- Get it at the Tikki Room! 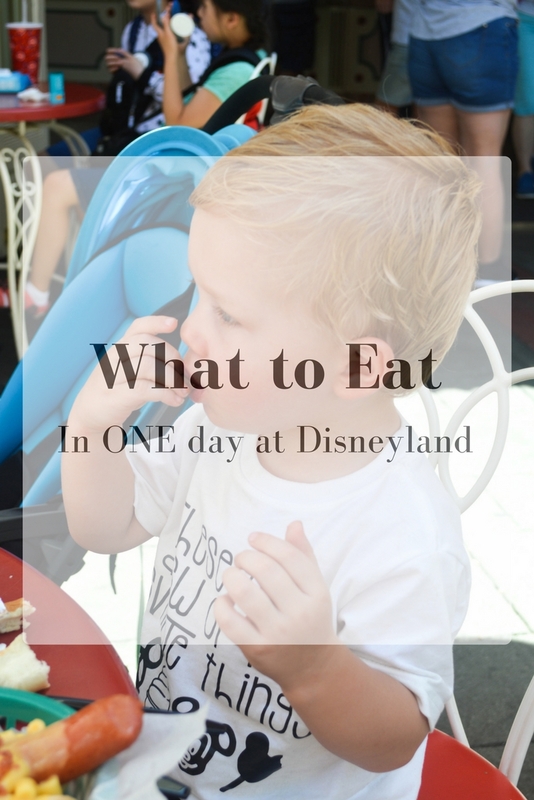 Granted, if you are in the parks for more than one day, there’s much much more delicious things you should eat. But, when you’re only there for 10 hours, your stomach can only hold so much so these are my absolute must haves! 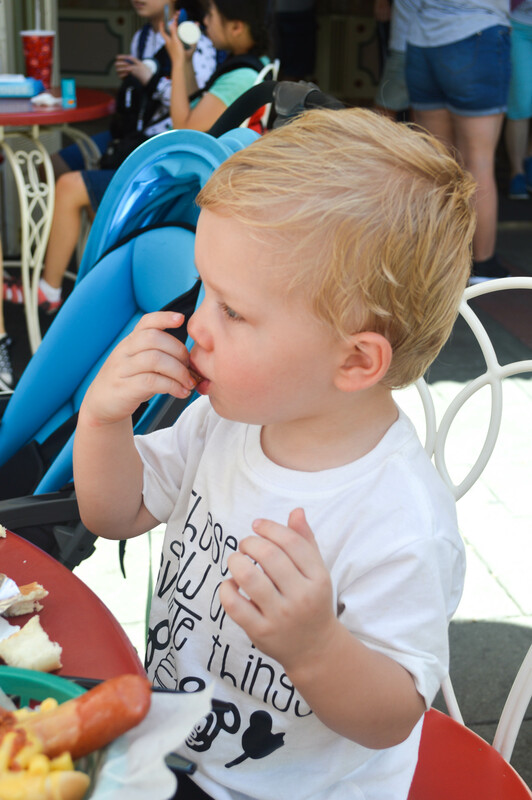 For lunch, Sawyer had a kids meal from the Refreshment Corner. It was turkey hot dog, milk, and carrot sticks. 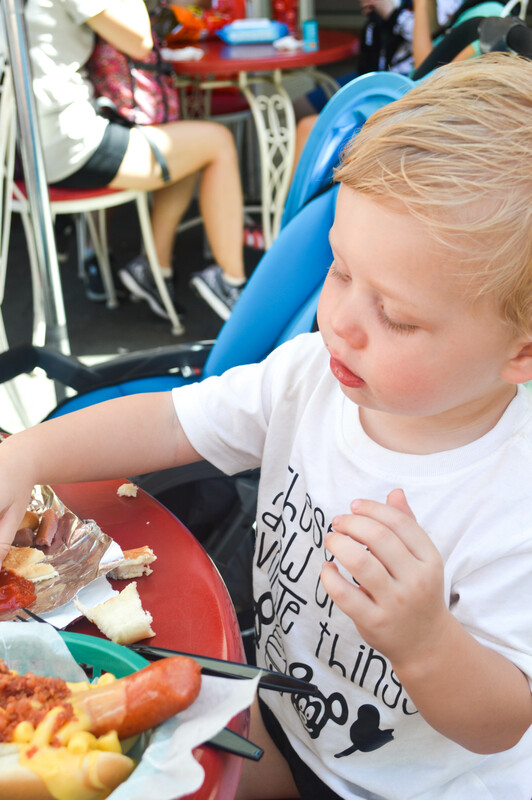 The perfect toddler lunch! 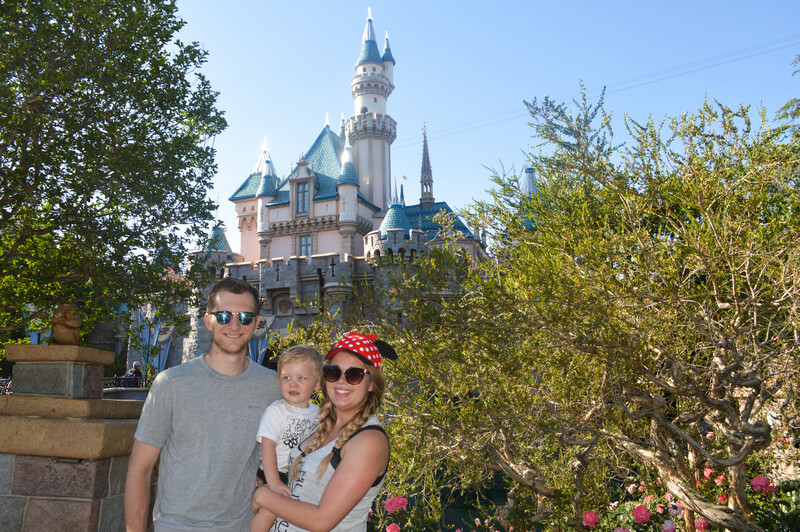 We had an amazing day at Disneyland. So magical and fun for the whole family! It was so magical to see it through Sawyer’s eyes. He gets in free until he’s 3 so I want to try and make one more trip before then! We really wanted to do something fun with our firstborn before he becomes a big brother. Kurtis and I will always remember this special trip when it was still just the 3 of us. 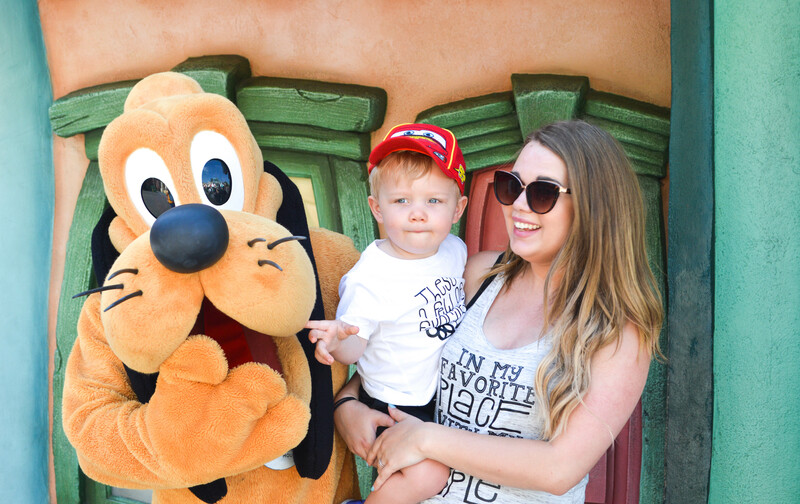 What are your tips for taking kids to Disneyland? Comment below!